Is Captain America 2 the origin story of another Marvel supervillain? 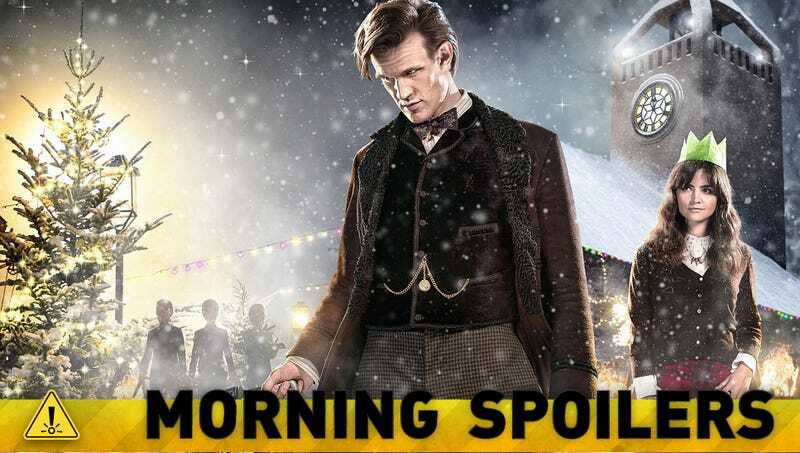 Get the first real details about Doctor Who's Christmas special. We may get a chance to see the director's cut of Snowpiercer after all, Ant-Man casting rumors are solidifying, and Avengers: Age of Ultron has a script ready. Plus, what's special about Norman Osborne's introduction in Amazing Spider-Man 2? Spoilers now! I stayed in New York for two weeks before coming here to Mar del Plata, mostly because of this matter. And the good news is that after all the speculation and comments about that 20-minute cut, and considering the original version that was released in Korea and France also will be released in Japan and Hong Kong, we have been talking a lot about keeping the original cut for the U.S. release, so what I can say is…have faith. I will say that it is an infinitely better situation now than when they were saying they wanted it in the summer. Before I even came onto the project, before I was brought on, they were talking about 2015 and they made this announcement very early on. Which I understand, and I understand why they'd want that, but it didn't necessarily have anything to do with the reality of where anyone was creatively. So I think that it's a hugely important thing that that comes first, and that a release date is great, but you have to release something great. So to me, the new release date is a huge improvement. We see you once in the Winter Soldier trailer, but are you throughout the movie? Yeah, yeah, yeah. It's an origin film. You meet people who are going to be around for a while, so they introduce the characters. It's almost like it's a series. It's fun. I can't say very much about it because Marvel's very strict about what you're allowed to say. The movie, we've seen bits of it, and it is spectacular. Well, the trailer looks awesome. Yeah, and that's just a tiny bit. But I think comic book readers know that Brock is Crossbones, so we wonder how close he gets in his first appearance. I can't say any of that because they will fire me. Well, I imagine they have plans for Brock in the movies. They do actually. We'll see what happens. We'll see if the fans respond to Brock and how it goes. [Amazing] Spider-Man 2' was an introduction to Norman. And — you'll see — an extremely odd introduction, which apparently will lead to something more. I just love Scarlet Witch. I love her. It's so funny because I'm often talking about all these psychologically damaged people, but when you talk about Scarlet Witch... She is a messed up lady. She has got more sh*t to deal with than anybody else I know. I'm excited to figure out what's appropriate to use for her, because there's so much material from all of these decades, and we're going to tell this one story. So to be able to choose what you're going to bring into it from all of this abundance, it's really fun. Simon (Robert Sheehan) is turned into a vampire. And he goes from being this human who's Clary's friend to this ravenous undead thing. Robbie was actually my idea. "I saw him in 'Misfits,' which is a big comedy hit in Britain, and he's just so good and yet also able to be heartbreaking and I thought he'll be great and he will enjoy the hell out of being a vampire. All I'll say is that Brienne has deliberately assumed many male attributes in order to cope in this world. But I don't think as a woman she's naturally like that. She's had to work very hard and behave like a man and only in behaving like a man has she gained any respect from this traditionally very male-dominated world. It's particularly acute in the environment she's chosen to put herself in… that of being a knight. She comes from the Island of Tarth. Her father is Lord Selwyn Tarth and there's an extraordinary back-story in the book about how she became a knight. She never wanted to get married and yet she had to. So she said, 'If I manage to beat you in a sword fight I will not marry you.' The man very arrogantly said, 'Well if I beat you, you will marry me.' We know what happened! It's actually very similar to the myth of Atlanta in Greek mythology, who had to go through a similar process. What's funny with the show, the way that it's written is so out of sequence that chronologically you don't know what's going to happen. So we're learning bits and pieces in flashbacks as we speak. I just shot an episode last week that will shed a little light on Tinkerbell's back story, but yeah, we only learn it in pieces as we go as well. So it's quite a lot of fun to pick up each episode and learn backwards where you're from and where you're going. We explore a little more about how Tinkerbell knows Hook. But it soon becomes clear that Jason's gluttony has come at a price as he begins to exhibit some seriously strange behaviour. As things spiral out of control, it falls to Hercules and Pythagoras to save their friend before Heptarian and the palace guards bring his exertions to heel for good.